Look at that isn’t it beautiful!? How many times have you seen something in nature and been blown away by how gorgeous it is? The sky, a lake, a volcano, and a field covered in crisp, fresh snow are all a feast for the eyes. All exist in nature with no human intervention; they would be there whether or not we are around to appreciate them. Nature and the Earth are special, but there are certain things that are on a whole other level and are considered natural phenomena. A natural phenomenon is something that occurs in nature that is particularly extraordinary or spectacular. The key thing with natural phenomenon is that it has nothing to do with humans. Phenomena occur in all areas of the Earth; the geosphere, hydrosphere, and atmosphere. Some of the most impressive phenomena also feature incredible colors via different biological and chemical processes. The geosphere is everything that makes up the various layers of the Earth. From the top soil in the earth’s crust to the minerals and rock formations deep underground, this area covers everything from sand to land-forms such as mountains and canyons. There are many notable phenomena in this area, but Yellowstone National Park is a hot bed of geothermal and geological natural phenomena. Yellowstone is home to a super volcano caldera as well as vast geothermal fields full of geysers and hot mineral springs. The Yellowstone Caldera is the largest active super volcano on the continent and measures about 34 by 45 miles. As the name might imply, a super volcano is a large volcano capable of a huge magnitude 8 eruption, which is the very top of the volcanic explosivity index. The one at Yellowstone has erupted with tremendous force three times in the last two million years. The caldera looks different from a typical volcano because instead of a mountain-like cone it is a large cauldron-like hollow. Basically, a large amount of magma erupted over a short period of time causing the surface to collapse downward into the partially empty magma chamber. It looks like a crater, but it is more of a sinkhole hovering over an active magma chamber. The Yellowstone Caldera’s magma chamber is estimated to be a single connected chamber about 37 miles long, 18 miles wide, and 3-7 miles deep. The caldera is so large you won’t even realize you are in it when you visit! It takes up a large chunk of space at the park and features several interesting geological phenomena including mineral hot springs and geysers. Within the caldera is an area called the Midway Geyser Basin, which is home to the beautiful Grand Prismatic Spring. All the vivid colors of the rainbow can be seen here at this bubbling 160 degrees hot, mineral spring. The vivid colors you see are thanks to large colonies of microorganisms around the edges of the mineral-rich water. The colonies produce colors ranging from green to red depending on the season; in summer it is more orange or red and in winter it is a dark green. The center of the pool is a vivid blue because it is super deep and too hot to support life. All of these elements combine to create a rainbow-like effect from the edge of the spring to the very center. Another strikingly blue natural phenomenon can be found in the hydrosphere or more specifically the cryosphere. The hydrosphere contains all the water on earth from salty oceans to fresh water lakes and underground aquifers. The cryosphere is just the frozen parts of the hydrosphere; glaciers, ice fields, icebergs, etc. 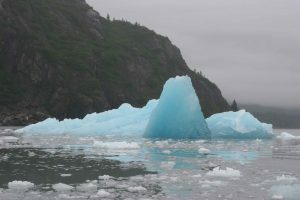 Blue ice is a fascinating phenomenon you see in icebergs and glaciers. Glaciers are made of fallen snow that over many years has been compressed into large, thick ice masses. Most glaciers are found near the poles, but all the continents have glaciers. Each year in areas where the snow never fully melts away, new snowfall is added to the compacted layers, increasing the size of the glacier. Over time as gravity and new snow mass push down on the older layers, there is less and less air in the glacier and more and more ice as the ice crystals grow and push more air out of the ice mass. This is exactly how blue ice forms! The top layers of ice appear to be white because air bubbles create pockets of space between the water molecules. 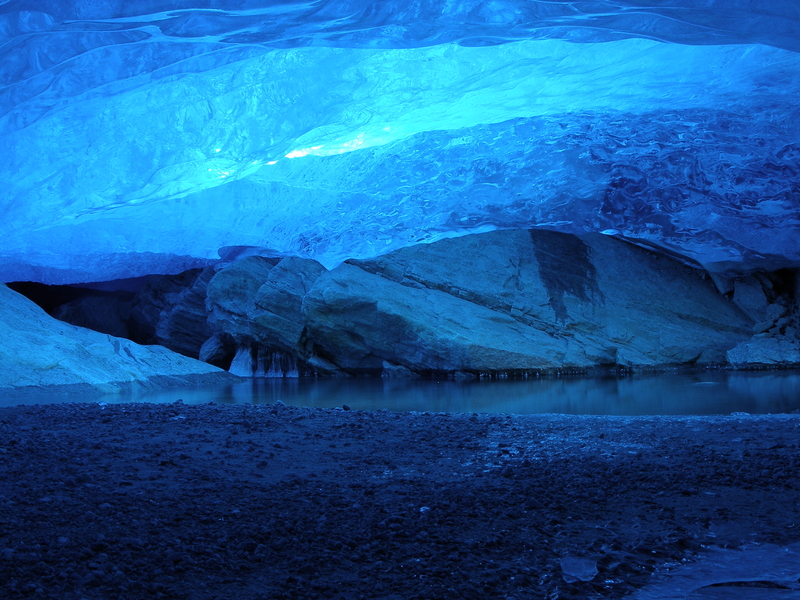 Deep within the glacier, the pressure causes the air bubbles to be squeezed out, increasing the density of the ice. The molecular bonds in the water molecules stretch and selectively absorb red light leaving behind a vivid blue color. You can see blue ice when pieces, i.e. icebergs, break away exposing the layers, in a crevasse, or in caverns within the glacier. Another example of a colorful natural phenomenon can be seen in the atmosphere. The atmosphere is the envelope of gases surrounding the Earth and is made up primarily of nitrogen and oxygen. These gases regulate the Earth’s climate and allow us to live and breathe. If you’ve ever traveled somewhere close to the arctic circle or Antarctica you’ve probably seen the phenomenon known as the northern lights or aurora borealis. 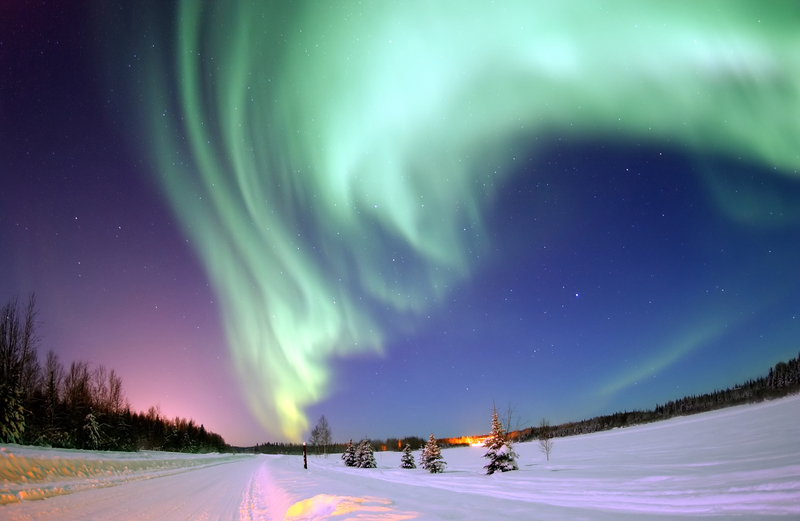 The aurora borealis is a natural light display that you can see if you travel to either pole on Earth. 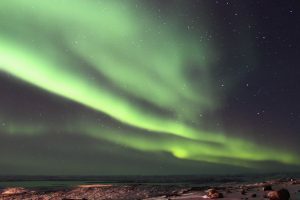 The pattern of lights is created by the interaction between Earth’s magnetic field, gas elements in the atmosphere, and highly charged electrons from solar wind. The ionization and excitation of particles in the Earth’s atmosphere creates the wavy patterns whose color depends on the elements that are reacting. This happens in the Arctic and Antarctic because that is where Earth’s magnetic poles are located. Nitrogen and oxygen in the lower atmosphere produce the most common aurora borealis color of green, but there are also pink, purple, yellow, and blue patterns depending on where and what is reacting! All three of these are impressive examples of natural phenomena that occur in far-flung parts of the world. You don’t have to travel far to see other examples of phenomena though. Thunder, fog, rainbows, ocean currents, erosion, and gravity are all examples of natural phenomena that you might experience in your own backyard. You can create your own science painting of the aurora borealis with our at-home experiment!